The Mid-Autumn Festival is a traditional holiday in China,is coming.The holiday from Sep.22 to Sep.24,2010, our office will closed during the holiday. The joyous Mid-Autumn Festival was celebrated on the fifteenth day of the eighth moon, around the time of the autumn equinox（秋分）. Many referred to it simply as the "Fifteenth of the Eighth Moon". This day was also considered as a harvest festival since fruits, vegetables and grain had been harvested by this time and food was abundant. Food offerings were placed on an altar set up in the courtyard. Apples, pears, peaches, grapes, pomegranates（石榴）, melons, oranges and pomelos（柚子） might be seen. Special foods for the festival included moon cakes, cooked taro（芋头）and water caltrope（菱角）, a type of water chestnut resembling black buffalo horns. Some people insisted that cooked taro be included because at the time of creation, taro was the first food discovered at night in the moonlight. Of all these foods, it could not be omitted from the Mid-Autumn Festival. The round moon cakes, measuring about three inches in diameter and one and a half inches in thickness, resembled Western fruitcakes in taste and consistency. These cakes were made with melon seeds（西瓜子）, lotus seeds（莲籽）, almonds（杏仁）, minced meats, bean paste, orange peels and lard（猪油）. A golden yolk（蛋黄） from a salted duck egg was placed at the center of each cake, and the golden brown crust was decorated with symbols of the festival. Traditionally, thirteen moon cakes were piled in a pyramid to symbolize the thirteen moons of a "complete year," that is, twelve moons plus one intercalary（闰月的） moon. The Mid-Autumn Festival is a traditional festivity for both the Han and minority nationalities. The custom of worshipping the moon can be traced back as far as the ancient Xia and Shang Dynasties (2000 B.C.-1066 B.C.). In the Zhou Dynasty(1066 B.C.-221 B.C. ), people hold ceremonies to greet winter and worship the moon whenever the Mid-Autumn Festival sets in. It becomes very prevalent in the Tang Dynasty(618-907 A.D.) that people enjoy and worship the full moon. In the Southern Song Dynasty (1127-1279 A.D.), however, people send round moon cakes to their relatives as gifts in expression of their best wishes of family reunion. When it becomes dark, they look up at the full silver moon or go sightseeing on lakes to celebrate the festival. Since the Ming (1368-1644 A.D. ) and Qing Dynasties (1644-1911A.D. ), the custom of Mid-Autumn Festival celebration becomes unprecedented popular. Together with the celebration there appear some special customs in different parts of the country, such as burning incense（熏香）, planting Mid-Autumn trees, lighting lanterns on towers and fire dragon dances. However, the custom of playing under the moon is not so popular as it used to be nowadays, but it is not less popular to enjoy the bright silver moon. Whenever the festival sets in, people will look up at the full silver moon, drinking wine to celebrate their happy life or thinking of their relatives and friends far from home, and extending all of their best wishes to them. There is this story about the moon-cake. during the Yuan dynasty (A.D. 1280-1368) China was ruled by the Mongolian people. Leaders from the preceding Sung dynasty (A.D. 960-1280) were unhappy at submitting to the foreign rule, and set how to coordinate the rebellion without being discovered. The leaders of the rebellion, knowing that the Moon Festival was drawing near, ordered the making of special cakes. Backed into each moon cake was a message with the outline of the attack. On the night of the Moon Festival, the rebels successfully attached and overthrew the government. 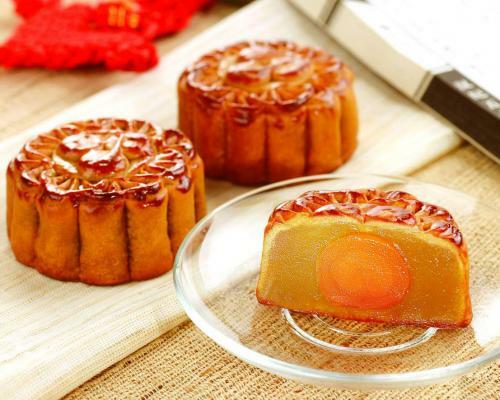 Today, moon cakes are eaten to commemorate this legend and was called the Moon Cake. For generations, moon cakes have been made with sweet fillings of nuts, mashed red beans, lotus-seed paste or Chinese dates（枣子）, wrapped in a pastry. Sometimes a cooked egg yolk can be found in the middle of the rich tasting dessert. People compare moon cakes to the plum pudding and fruit cakes which are served in the English holiday seasons.